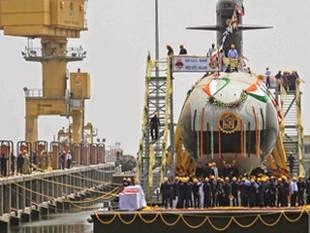 Kalvari, first of the Indian Navy’s Scorpene class stealth submarines being built under the Project 75, under collaboration with M/s DCNS, France, achieved a major milestone today with her ‘undocking’ at the Mazagon Dock Limited (MDL). The event was witnessed by the Defence Minister Shri Manohar Parrikar, the Chief Minister of Maharashtra Shri Devendra Fadnavis and the Chief of the Naval Staff Admiral RK Dhowan amongst other dignitaries present at the landmark occasion. Addressing the staff and workers at a glittering ceremony at the Eastman yard, Shri Parrikar urged them “to strive towards making the yard a globally renowned one and to play a critical role in Indian Navy’s goal of becoming a true Blue water Navy”. The project 75 which has already seen a delay of almost 40 months has now been brought on track and the delivery schedule for the successive submarines have been reduced. Shri Parrikar asked the defence public sector yards viz. Mazagon Docks Limited and Goa shipyard to double their production in the coming three years. Shri Parrikar said as far as P75(I) Project is concerned, private players can also be invited for joint venture which would help early fruition of the project. He warned that if the project is not completed in the stipulated time, the defaulting yard would have to pay penalty but an early completion would be rewarded with a bonus. He also asked MDL to take a lead in the skill development of local unemployed youth. 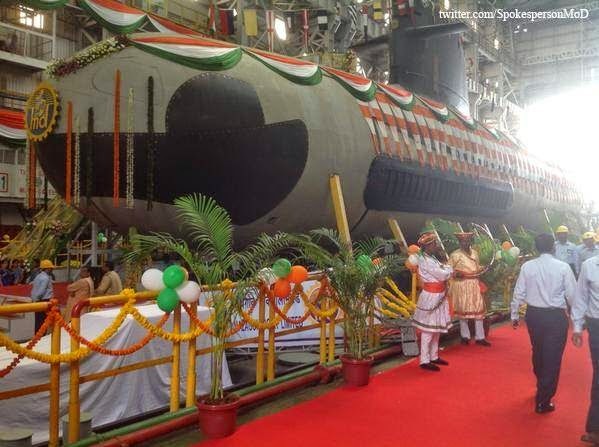 With a name steeped in the long and glorious tradition of its illustrious predecessor, an erstwhile Russian ‘Foxtrot’ class submarine, Kalvari, upon its scheduled commissioning in 2016, would lend an enormous fillip to the Indian Navy’s underwater capability. The remaining five boats of the Project 75 would be delivered by the yard to the Navy by 2020 and would form the core of the Navy’s submarine arm for the next two decades. The Scorpene submarines would pack a potent punch. She would be equipped with anti-ship missiles and long range guided torpedoes alongwith modern sensor suite. 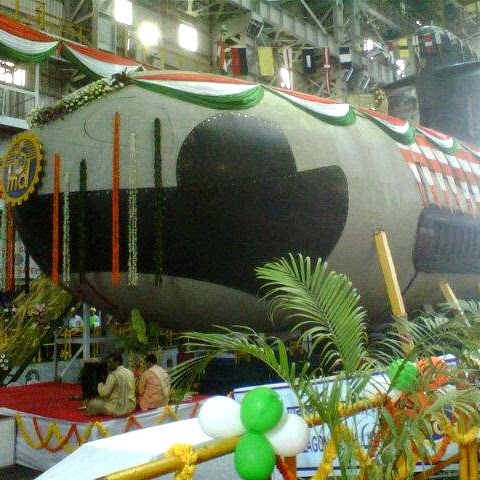 After having delivered two Shishumar class submarines in the early nineties, the event further highlights MDL’s position as the premier submarine building yard for the Indian Navy. From a small dry dock built to service ships of the East India Company, MDL today is at the forefront of warship construction with the P 15 B class destroyers and P 17 A class stealth frigates being the latest. As the exclusive public sector shipyard manufacturing submarines in the country, Project 75 marks a critical milestone in the Yard’s continued relevance asa defence public sector undertaking constructing submarines.